Are you looking for the opportunity to think differently about your position as a middle manager and how to cope with the impact of change? Would you like to work as part of a cross-departmental team and develop the skills needed to meet the challenges of the 21st century? The Middle Manager Academy (MMA) North 2018 will be taking place in Huddersfield this autumn and could be the opportunity for you. What is the Middle Manager Academy North? The MMA North is a unique cross-departmental development opportunity that has been designed to equip HEOs and SEOs (or equivalent grades) with the personal, professional and collective leadership skills needed to meet the​ current and future demands of the Civil Service. The academy aims to foster a more resilient and collaborative leadership culture amongst civil servants from departments across the North West, North East and Yorkshire and the Humber. The MMA North will provide you with the opportunity to support Civil Service transformation, whilst embedding and enhancing your skills. It will also encourage you to inspire others to become the leaders of the future. The MMA North 2018 will start with four learning and development days and there will be a mix of self-awareness, personal development and ideas production across the event with a number of keynote speakers and panellists. 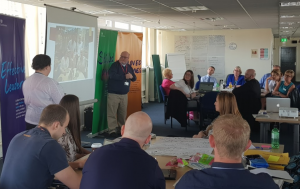 Over the following 12 month period, you will collaborate in cross-departmental teams to tackle challenging business issues that departments and agencies in the North are currently facing. Departments and agencies have been allocated places based on their proportional representation in the North West or North East and Yorkshire and the Humber region. Departments are responsible for deciding how their places are filled. If you are interested in this opportunity, please look out for communications within your organisation or speak to your line manager. Are you able to advise us who the Home Office contact for the Middle Manager Academy North 2018 is please? I will email you directly about this query. I will email you directly around this query. Please advise who in the Insolvency Service is the contact regarding the MMA? There are 70 places available for the MMA North 2018. We have given each region (i.e., North West; North East and Yorkshire and the Humber) an equal number of places, which have then been allocated to departments based on their proportional representation in the region and their engagement with Civil Service Local. We will respond to specific queries about department allocations on an individual basis. could you direct me to the Home Office contact regarding this opportunity please? I will email you directly regarding this. I will reply via email. I have few questions can I speak to someone about it? I will reply to you via your email. Can you email me who I need to contact to find out more about this? Hi Paul, I work in Nottingham and so am not eligible for this opportunity. Can I ask if this programme will be available for Nottingham site workers in the future? Thanks for the message. Apologies for not replying immediately. I have replied directly with the answer. Thanks for the message. I've replied to you directly by email. The closing date for the Academy application from your department was the 6th September. Sorry that you've missed this year's deadline. Each department arranged how to fill the spaces they were allocated so if you weren't made aware of the opportunity, it might be worth asking how it was advertised in your area. Hi - Can you please advise who I should contact within DWP for more details please, and can you advise of the closing date? Morning, Please can you advise if any spare places are available, would you consider Band D grades (EO) to attend? The Middle Managers academy is designed for HO & SO grade staff. The FLM Academy which has been on this week is designed for Band D (EO) managers. Hope this clarifies the levels they are designed for. Grateful if you can advise who the Home Office or UKVI contact is please? Apologies but the application process for the Middle Manager Academy closed on the 6th September. Can you tell me who was the contact for HMRC please.